Molehill has won the Chicago Hard Rock Rising Battle of the Bands. 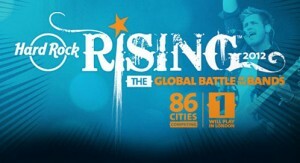 This means we are on to the Global Round where we will compete with 85 other bands from across the world to have the opportunity to play at Hard Rock Calling 2012 in London. Bruce Springsteen is headlining the event. Soundgarden and Paul Simon are also performing. To help us advance in the contest we need everyone to ‘like’ the Hard Rock page and download our song. Voting will not start for a few more days. We will have more details with links coming soon. We are honored to represent the City of Chicago in this contest and would not be here without anyone who has already helped us get to this point. Let’s keep it going!